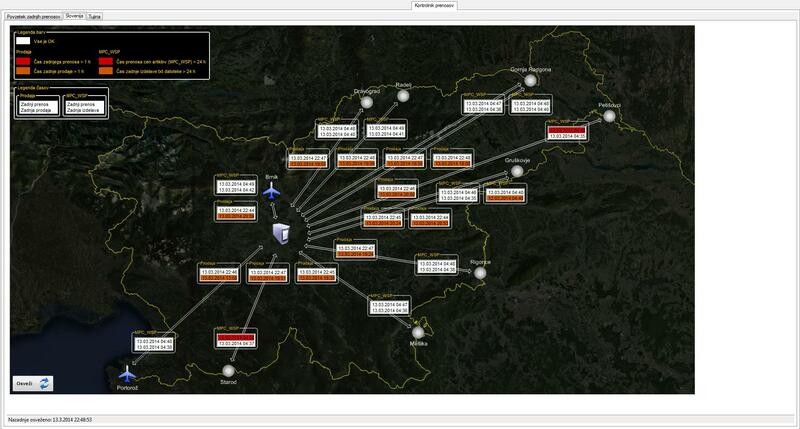 Developing custom made multisite with central and customer databases for sport clubs and shools. Editors can enter results for different testings for club/school members and send messages to their parrents. Members can see results, graphs, compare their results with average results. Development of new WordPress website Letni časi for Zadruga Skupaj z.b.o. Spring 2017. Upgrade of website Seasons (slo. Letni časi) – ordering healthier food into a multi store. Now it’s possible to manage multiple stores on separate subdomains using one single administration. June 2015. Development of ecologically oriented, WordPress based responsive website Myths about GMO / GMP. July 2015. 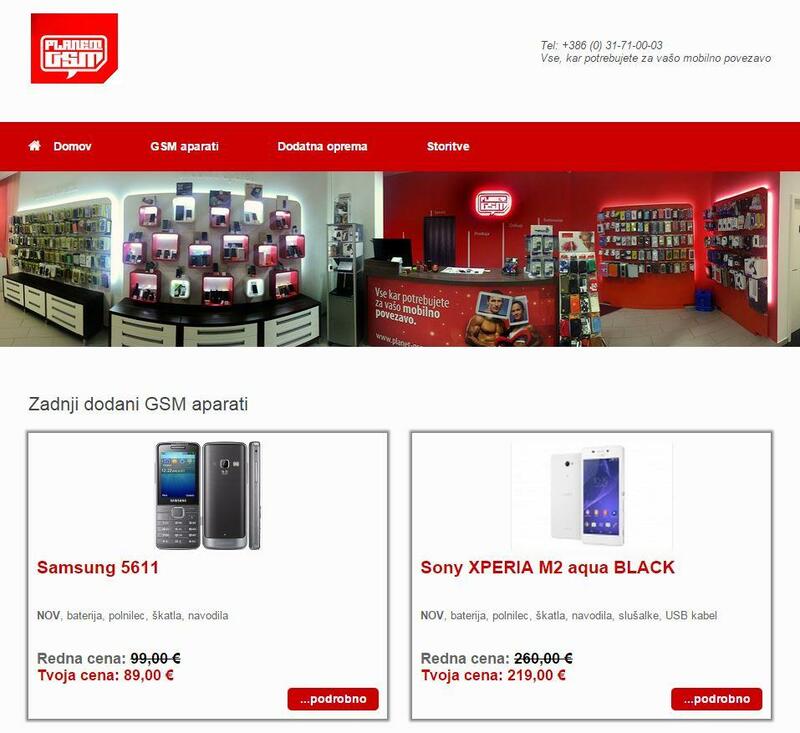 Development of WordPress based responsive website Planet GSM for Sanja Hukolli BrE. I’ve also programmed a WordPress module that pulls data about individual GSM devices from outside database and displays them as pages on this website. May 2015. In cooperation with another company I’ve developed a web cashier’s desk. The application enables user to choose products, add/remove products to/from cart, checkout, review invoices, print invoices, create credit memos. April 2015 . Development of websites for Center Premik LLC and Carate club Kolektor Idrija. United “under one roof” at URL www.premik.si. March 2015. Company Center Premik LLC needed an aplication that would enable their customers to see the sport testing results of their children. Like online fitness card. Therefore I’ve developed a WordPress plugin with backend and frontend. On backend administrators can manage users, testing attributes (jump, long jump, push-ups,… ), define testing participants and create testings. On frontend registered users can see the results for their child(ren). Frontend demo version. February 2015. I’ve developed and designed a website for society Eko civil initiative of Slovenia – www.ekoci.si. For free. February 2015. Since November 2014 I am working as a volunteer at cooperative Together (Skupaj z.b.o.) in a project called Letni časi (Seasons). Cooperative organises ordering and delivery of healthier and more quality, mostly organic food with help of a web application (sort of web store). I am the administrator of this application. In addition, I developed several applications for managing orders, deliveries, products, dealing with farmers, informing,… For example, I’ve programmed an application that enables administrator to manage products very easy. Using magento administration it takes about 5 minutes to add one new product into this specific “web store”. My application speeds up this process for more than 5 times. Web service with search mechanism that enables advanced search of organic farms and detailed information about their offer. User can use filters to narrow down search results which appear on the screen asynchronously. The search results also contain links to farms’ presentation pages, off-site web pages, their locations on Google maps. The application is linked to Google maps in another way – it offers a map of organic farms (food producers), categorized into groups, based on brands. 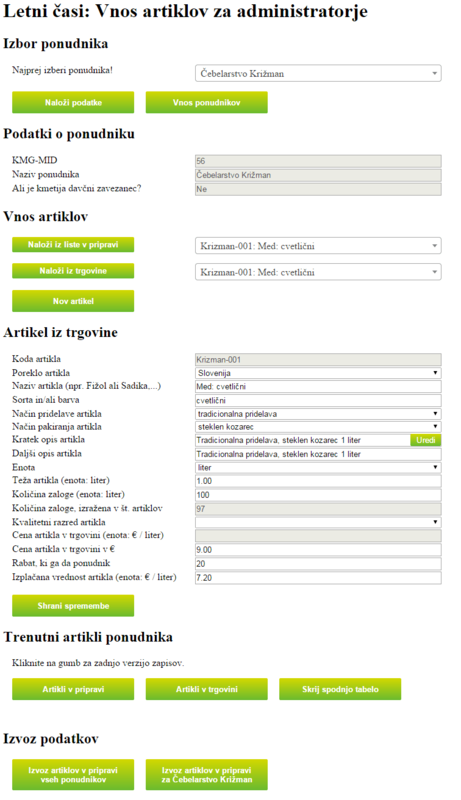 Web application includes presentation pages for each organic food producer. Producers are able to login/register and update their HTML presentation. Techonogy used: PHP, jQuery, MySql, Java Script, Ajax, HTML, CSS. Purpouse: enable consumers to have access to information about organic food offers and their products and enhance awareness of the importance of sustainable types of farming practices to improve the economic and health situation in Slovenia. Website URL: www.ekološke-kmetije.si. The project was upgraded into my thesis (Web service for searching the data about organic farms). Web application for presenting several restaurant offer at one place. Made for INNOVIT Ltd. June 2014. Development of Windows application that enables a whole set of manipulations for data about muscle responses to sudden discharge. It was a part of doctor dissertation project. Web application – Log in / registration module. Development of Magento module with backend and frontend that enables very intuitive graphic way of searching car products by brands and car types. Made for caraudioempire.com (demo version). 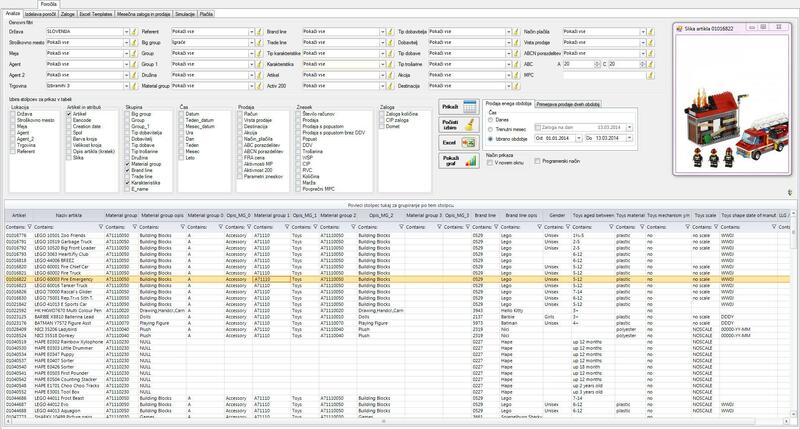 At backend the editor can define compatibility with brand and types of car for each product. The editor can also add new categories (brands and car types) which are then displayed in the search engine. In Java I’ve programmed an application that enables monitoring measurements of good and bad pieces of cars. The application has been used in a factory TPV PLC for more than 10 years. It’s stable and “independant of operating system”.TPV is a Slovenian company operating on the global market and has recognized itself more and more in the recent years as a development supplier in the automotive industry. From 2012 – 2014 I worked with my business partner Epsilon Ltd.
Epsilon is engaged in the development of business information solutions. 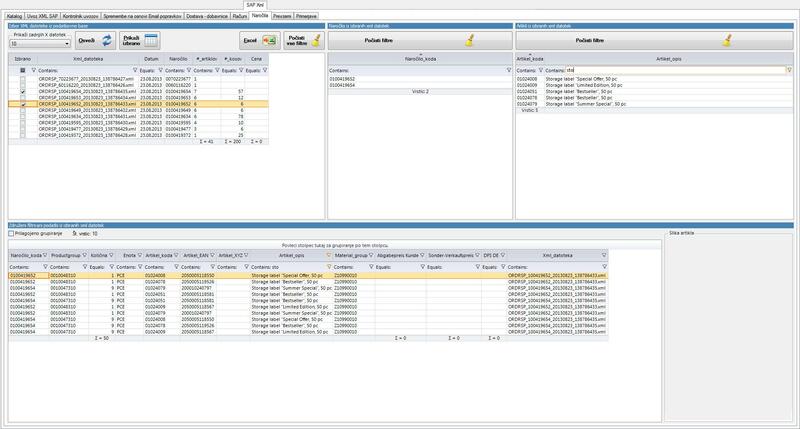 It also provides advanced solutions for transparent data processing (catalog (eg. items), invoices, delivery notes, orders, acquisitions,…). 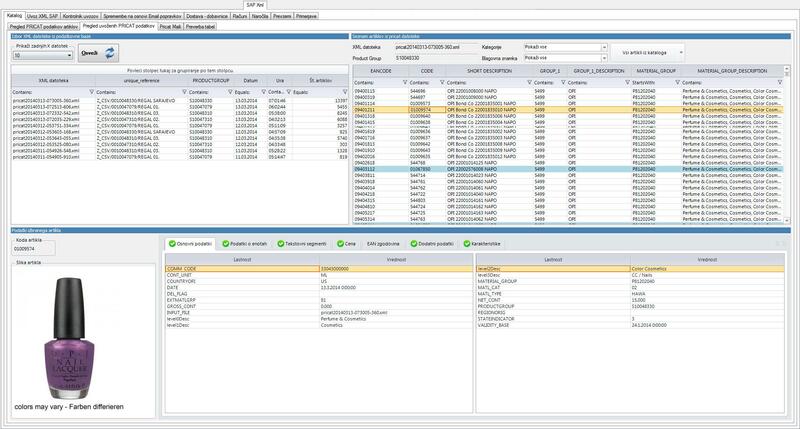 This data is received as an XML file, preliminary exported from SAP Business Suit. I’ve programmed dozens of various Windows forms. The greater part of the forms I’ve developed, was related to SAP. In a team of 4 programmers, we’ve been using multiple databases and using/creating/programming/managing a few hundred data tables, SQL store procedures and functions. On the project I was working on, we’d been using Visual Studio framework. We programmed in VB.NET (also C#) and MS SQL. Some of the Windows forms I’ve been working on (they are mainly the result of my work from both, as from program as design point of view) are presented in the gallery below. The whole application is a lot bigger and includes a few dozens of forms. 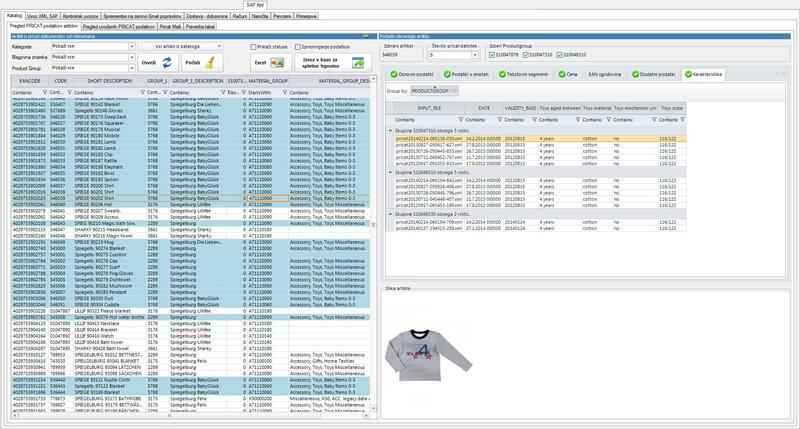 When programming for Epsilon, I was using Telerik WinForms a lot. From 2010 – 2012 I worked for the company Presentia Ltd. Representing company’s services. I was a meeting manager, adviser and educator for company’s customers. I worked in technical support – helped customers who were using company’s hosting service and / or wanted to register domain name(s). www.bigprint.si. Web store. I’ve independently accomplished entire project, including meetings and communications with a customer. I’ve programmed a Magento delivery module and many other functions. Customer had it’s own product’s photos. www.mybaby.si. Web store. I was involved in development and design process. My job was also to optimize it (SEO), add/adapt Magento modules, develop 3 Magento modules. www.mojlogo.si. Website. My job was to wrote text and optimize them for search engines. It achieved the best results on the SERP pages. www.dfhphoto.com. Website. I’ve developed and designed it. www.rokgrilec.si. Website, blog, forum. Mainly all done by me. 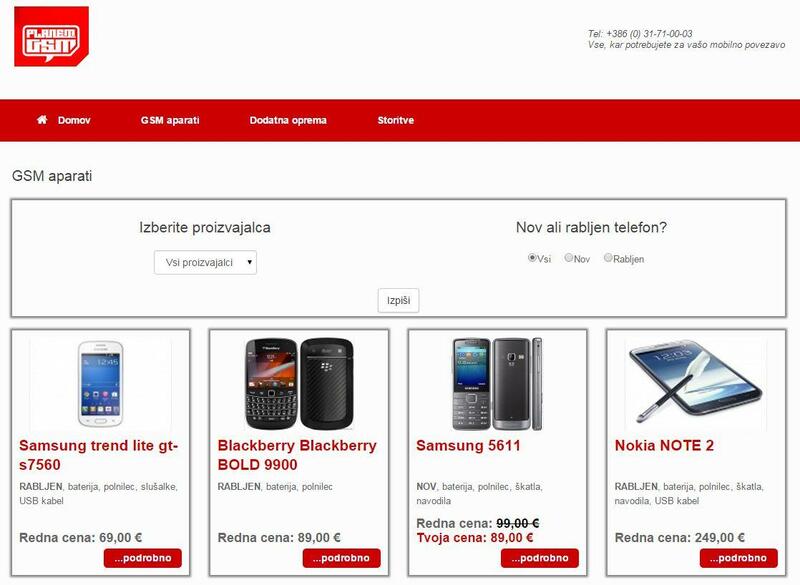 www.estore.si. Website. I wrote 90% of the text and optimized the page. www.presentia.si. Website. I’ve build dozens of pages from stratch, programmed a few functions. From 2015 – 2017 I worked for the company Zaslon Telecom Ltd. Programming (C#) plugin that automatically imports emails into a program Law Office that is wide recognized and used by Slovenian lawyers. Developing and designing a custom made web site for Turistična zveza Slovenije (tzs.link). Size possess a hierarchical access rights to several features (working hours management, fiinancial reports, events, news, person and society nominations, custom forms, etc.). 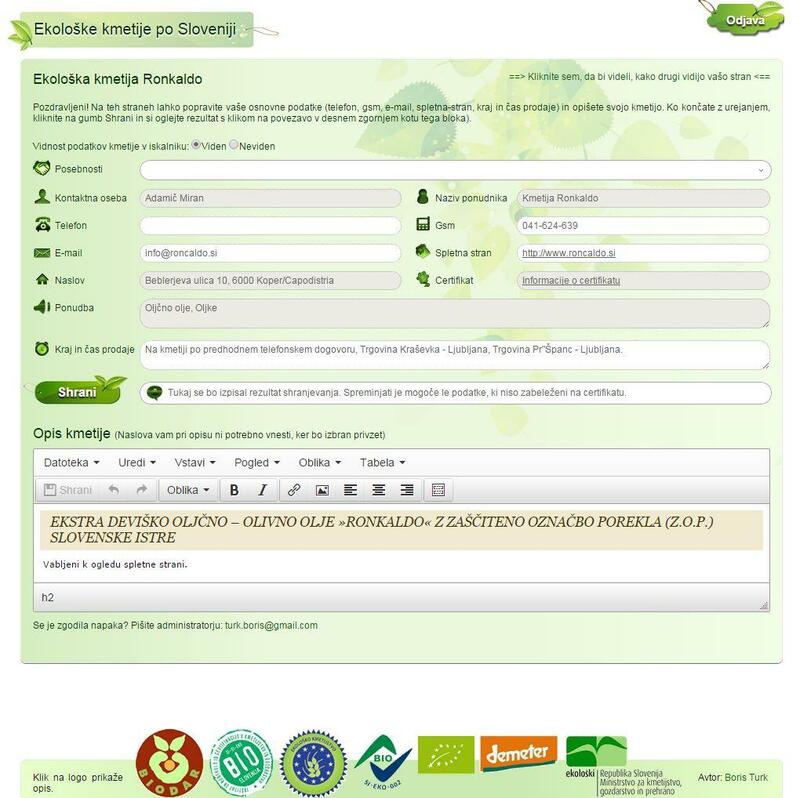 This site enables personal accounts and a better connection between more than 300 tourism associations in Slovenia. Developing and designing a custom made multiple database web application called Simplay SPP (Slide Presentation PRO). It is a technological marketing solution for editing and presenting custom presentations (images, videos, text, animations) on several big screens. Administrator can edit several presentation pages, define how many seconds each page is presented, connect pages into packages and then connect this packages to monitors. Each monitor can also have weekly or custom scheduler so that one monitor can play different packages at different times. SPP has been developed for many employer customers: Gospodarska zbornica Slovenije, Baby center, Atlantis, Lekarna Zupančičeva jama, Porsche Slovenia, etc. SPP can be and in many times is customized for each customer design and functionality needs. Web administration for internal website. 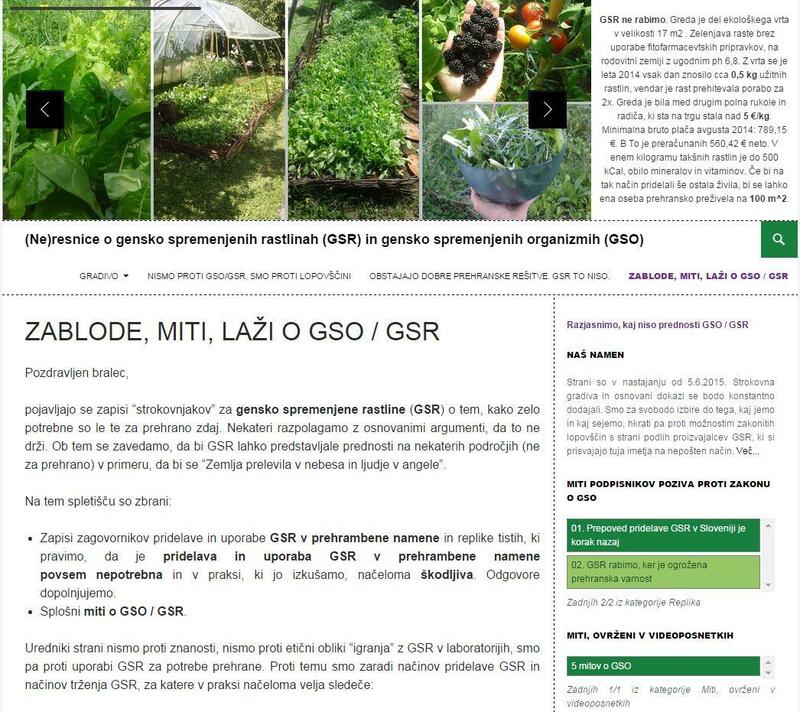 I’ve developed and designed gimb.org for Gimnazija Bežigrad.